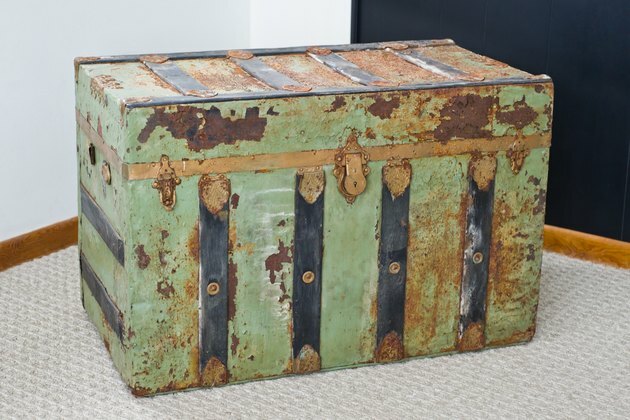 You may have inherited or purchased an antique trunk that has seen better days. These trunks are an interesting conversation starter that offer a large amount of storage space. They can be used as a bench at the foot of the bed, as a coffee table or even as a stand-alone room accent that adds character to the rest of the room. Although trunk refinishing may take a bit of time, this is a fulfilling weekend project for the do-it-yourselfer. It is safe to assume that an odor may be lurking in old trunk that has remained closed for years. Prior to beginning, wear a face mask, eye protection and gloves. Open the trunk and check its sides and bottom for a lining material. Examine it and determine whether it is worth preserving. More than likely, this is the source that is holding in or producing the odor. If it is removable, rip it out and discard. If it is not, then you will have to clean it very well. Wash the sides of your trunk with a solution that cleans very well, yet will not cause damage to your antique trunk. A homemade solution of 3 tbsp. of baking soda, 3 tbsp. of vinegar, 1 tbsp. of olive oil and 7 drops of your preferred essential oil or perfume mixed in a 32-oz. spray bottle will work nicely. Work in a well-ventilated space, spray the solution inside the trunk, wipe it with a cloth and let it sit open to air out for a little while. Spray the trunk again and wash its walls and bottom with a semi-damp cloth. Let it air dry, then sprinkle a generous amount of dry baking soda inside the trunk and let sit for one to three days, especially if the odor is overwhelming. Vacuum out the baking soda and clean the inside of the trunk again, repeating as necessary until the odor is gone. Use a clean, damp rag and pour a little olive oil on it to rub into the sides and bottom of the trunk's interior. Let air-dry and cure overnight. Trunks typically have metal hinges, latches or decorations. 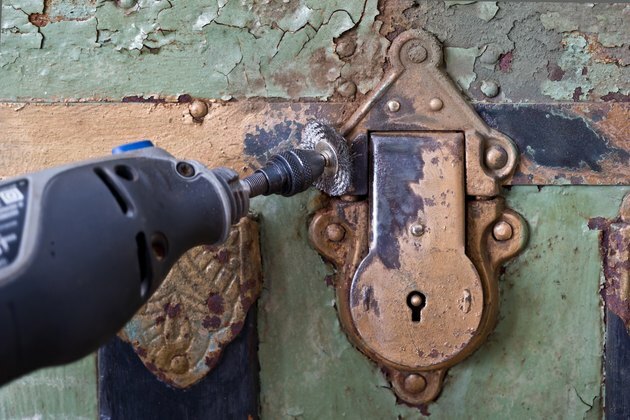 Use either a scrubbing pad, an electric-powered wire brush or metal polishes to remove the tarnish and dirt and to restore the shine of the metal. 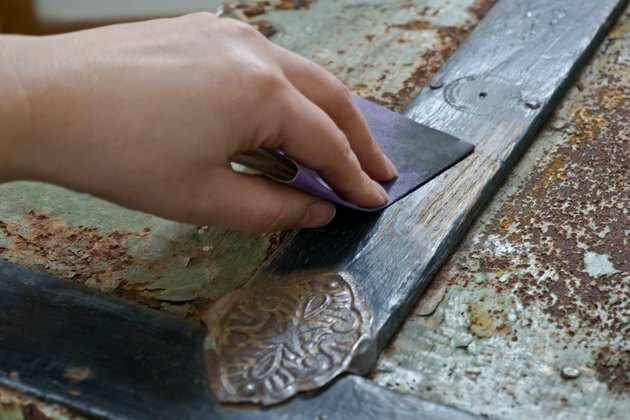 Wipe the metal clean with a cloth, then apply a little olive oil and lemon mix to help preserve the metal. Use leather cleaner to clean any leather handles or straps that decorate the trunk. After it is clean, use a leather dye and polish to add more life to the leather. Old trunks may be covered with a metal finish, wood or a canvas layer. The metal can be polished and sealed, and the wood can be sanded by hand, stained, antiqued and varnished to a shine. 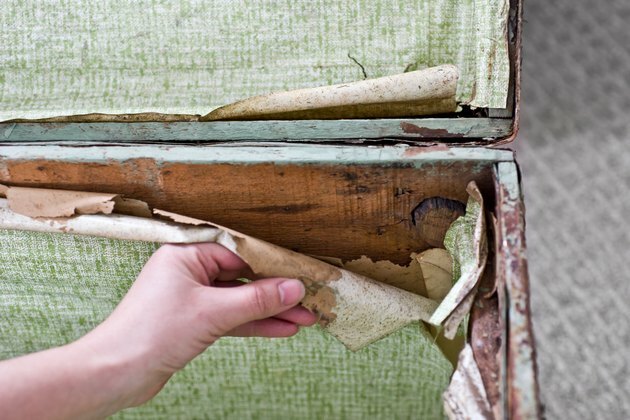 If the trunk is covered with a deteriorating canvas layer that tucks into and under other stationary parts, use precision tools--a sharp utility knife and needle-nose pliers--to cut away the canvas and reach into tight corners to remove it. Wipe clean, sand the wood and apply the antiquing to complete your trunk refinishing project.